I was a late bloomer to babywearing but it’s been one of the biggest joys for me during those early years with my babies and one of the things I’ll be the saddest to let go of once I move out of the baby stage for the final time. I have to be honest — I have no idea how I survived the early years of being a mom without an infant carrier. I wonder if I can be a babywearing grandma eventually? That being said, I recognize that as a new mom, babywearing, and all the options that come along with it, can be a bit overwhelming. That’s probably the primary reason I waited so long to give it a try. The thing about having all of those options is that you can usually find something that works perfectly for you, even if the first option you try doesn’t work out. Because it keeps your baby close while giving you your arms back. Remember all those things you did with two hands instead of one before your baby was born – dishes, putting on makeup, answering an email. You can’t do those things (or at least do them well) while holding your baby and a stroller in the house just isn’t practical. What about outside the house? Some babies just flat out don’t like strollers. They want to be with mom. Other times a stroller is more hassle then it’s worth. I loved wearing my baby for quick trips to the grocery store or if I was going to be in a crowded place that a stroller didn’t fit or where I was at risk of running over the heels of strangers. Babywearing is a great way to keep your baby close, especially during that newborn stage, and that’s great for bonding, calming a fussy baby, and breastfeeding. My babies have been much calmer when they are carried and the ones that I practiced babywearing with more often slept through the night much sooner. The most important thing babies can learn while they are young is trust and babywearing is a great way to promote trust. Your baby feels comforted and learns that you are there if she needs you. That has a wonderful way of calming a baby down. So, what are your babywearing options? I’m going to cover some of the most common options (and the ones I’ve liked the best. I’m not going over some of the options that didn’t work for me (Mei Tai carriers come to mind) but that doesn’t mean it won’t be a great fit for you. If there’s a carrier I haven’t covered that you’ve had good luck with, please share it with us in the comments. A soft structured baby carrier is one of the easiest to use and I’ve also found it to be the most comfortable (although with everything, this is purely personal preference). I tried out an older Snugli and later a Baby Bjorn before I was aware of the issues surrounding “crotch-danglers” (carriers that allow the baby to hang by the crotch) and the potential for hip dysplasia issues. Both of those companies have started moving towards a wider crotch design in their current products but I found that they were hard on my back as my baby grew so I never really caught the baby wearing bug. When my third son as 18 months old I began using an Ergo. I assumed I wouldn’t get much use for it since he was older but I was expecting my 4th baby so I planned on using it more down the road. I was wrong. The Ergo was so comfortable I barely felt the weight of my 18 month old. Sadly I lost my 4th son at birth but I continued using the Ergo until my 3rd son was over 2 very comfortably and from then on I was a baby wearing convert. While I have love, Loved, LOVED my Ergo with a passion for years I’m afraid I’m cheating on it now. At this year’s ABC Kids Expo in Las Vegas I was introduced to the Lillebaby carrier and I’m amazed at how much more supportive it is. With lumbar support and an extra wide belly panel this carrier is so much more comfortable then anything I’ve worn before and it allows for 6 carrying positions! You’ll probably see this carrier in lots of future Instagram photos I’m sure because my 16 month old would much rather be carried then ride in her stroller most of the time. Other soft structured carrier options include the Boba 3G Classic, the Onya Baby Outback Carrier, and the Beco Soleil baby carrier. I was intimidated by baby wraps for years. They looked scary. Even now when I introduce them to people the most common response I get is “I don’t think I would be able to do that”. Fortunately they aren’t as scary as they look and they offer a lot more flexibility than more structured carriers, especially for the newborn stage. There are some great videos online that teach you how to properly use a wrap and each brand includes their own illustrated instructions. I always recommend that parents practice a few times with a doll or with a second set of hands as a spotter until they get more comfortable with a wrap. I look at it like this — if I can do it, anyone can do it. Seriously. I’m kind of clueless with most things but within a few days of using a wrap I felt pretty confident with it and I loved the fit I got and how easy it was to adjust things based on your own needs. My now 16 month old was carried almost exclusively in a wrap for the first 6 months of her life and she can still fit very comfortably in one (although I do prefer the ease of a soft structured carrier at our current stage). Wraps are one size fits all, which is great if you need to switch back and forth between caregivers. My husband was scared of the wrap so he wouldn’t use it himself but he did finally come around and say if I tied it on he’d wear the baby in it. The actual process of putting the wrap on was just overwhelming to him. I was nuts for our Boba Wrap (pictured in orange at the beginning of the post) because of the gentle stretch and how soft it felt against my baby’s skin. I’ve heard from a lot of moms who love the Moby wrap too. It is a bit less stretchy than the Boba, which was a harder adjustment for me since I had gotten used to the feel of a Boba Wrap but that’s completely personal preference. Ergobaby is introducing a new wrap in early 2014 and after seeing it the ABC Kids Expo this year I suspect it may be my new favorite but I’ll have to wait until I try it in action to make a decision on that. If you want to move into something with less stretch, woven wraps may be your thing. They have a bit steeper learning curve but are a better option with heavier babies and allow more variety in the variety of ways you can wear your baby. 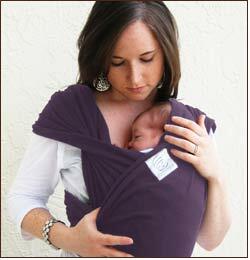 If you want the feel of a wrap without the hassle, the Baby K’tan is perfect. I LOVED this during the newborn stage and for times when I needed to get a wrap on quickly (like short trips to the stores). The Baby K’tan is a ready-to-wear wrap with a double loop design that doesn’t require any fancy tying. # 1 Baby K’Tan – I LOVE this option for newborns and ease of use with older babies. #2 Boba Wrap – The stretch of this wrap makes it so easy to get a great fit. #3 Moby Wrap – This is close behind the Boba for me but because this is personal preference on the feel it may be your top pick. I found it harder to get a great fit with this wrap but I’m a late bloomer when it comes to using wraps so I like things that make it easy. Slings are one of the simplest infant carriers out there and they take up almost no space so they are great for fitting into your diaper bag. I used a sling with my boys when they were newborns and loved them for around the house. The support isn’t as great as some of the other options out there simply because you are only taking advantage of one shoulder but they are easy to use and quick to get on and off. Slings are usually fitted so you need to make sure you are buying the right size for your body. You usually get a great fit with this. The downside is if your husband wants to take a turn carrying the baby he’s out of luck (and so are you). My husband actually wouldn’t use a sling because he just didn’t think it was very masculine but he’ll gladly use some of the other options (with the exception of a wrap, see above). I used the Hotsling with my second and third sons and had great luck with them. They have a huge variety of patterns to choose from and are one of the most affordable options out there. Hotslings now makes an adjustable sling which may be a great option if you don’t know your size or want to use your sling for multiple caregivers. With my third son I discovered ring slings and used a Maya Wrap for years. The ring design makes it adjustable so you can get a great fit, although it is a bit bulkier to fit in a diaper bag. If you want the feel of a sling with a bit more support, I recommend the Baby K’Tan which came about when an innovative mom began using two slings crossed in opposite directions and formed the Baby K’Tan off of that design. The end result is something that’s a bit of a cross between a sling and a wrap. Frame carriers are by far the biggest carriers available but often provide the greatest support. If given the choice, my husband will always choose a frame carrier. Me, on the other hand, for some reason I don’t have the right kind of back strength for a backpack carrier and these have never worked well for me — I think it’s something about how high you end up carrying with these. Frame carriers are amazing for camping or hiking, but I’ve heard from moms who love them for trips to the store or as a way to keep their hands free while doing housework because they feel like the support is amazing. Frame carriers also offer some great options for storing your stuff, but you have to keep in mind that filling all those little pockets will add on extra weight. 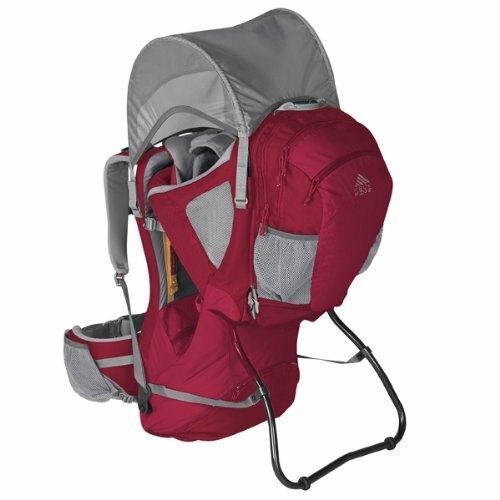 The Kelty Pathfinder 3.0 is the ultimate in frame infant carriers. 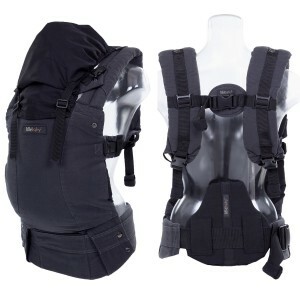 This provides great support for even the longest hikes and includes a sun shield to protect your baby’s sensitive skin. This carrier stands on it’s own so it’s easy to get baby in and out and includes plenty of storage for all your stuff. If you want something a big lighter for daily use, the Chicco Smart Support Backpack would be a great choice. At 7 pounds, it’s actually about the same weight as the Kelty but without as many extra storage options you won’t be tempted to load it up with stuff and it’s much less bulky. 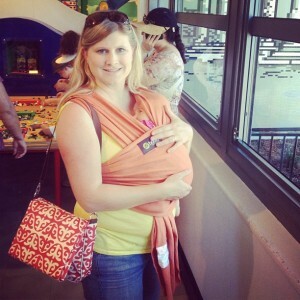 I like the baby wrap and sling carriers. They look lighter and more comfy for the baby.